ASCUS Art & Science, a non-profit founded in 2008 and based in Edinburgh, Scotland but serving an international community. It is committed to bridging the gap between art, design and the sciences by exploring how art, design and science can engage new and wider audiences for both fields. Below are a series of examples of art meeting science from around the world. 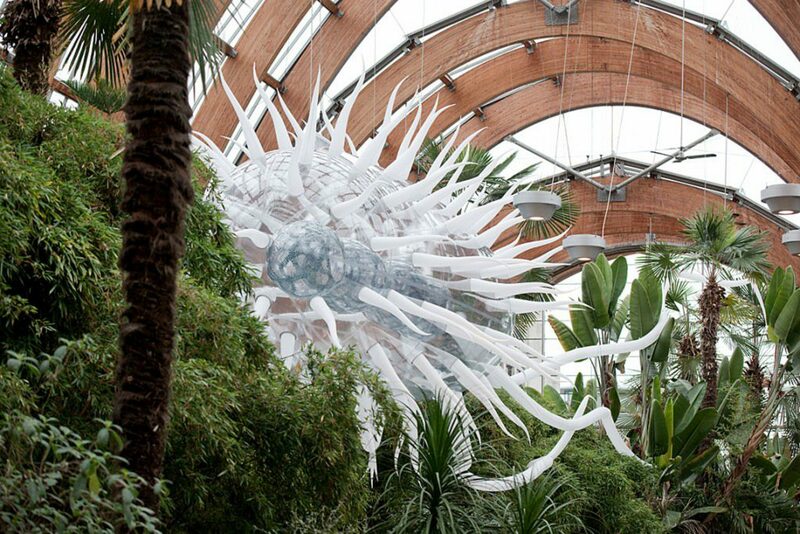 This giant inflatable E.coli sculpture (above) made by artist Luke Jerram was originally unveiled at the University of Sheffield and is now featured as part of Oxford Museum of Natural History’s Contemporary Science and Society series. Bacterial World, running until May 28, 2019, the exhibition explores the reputation of bacteria and counters the popular misconception that all bacteria is bad, or to be feared. Incorporating more than 55 exhibits – spanning monumental art, geological and deep-sea specimens, film, and digital interactives – Bacterial World demonstrates how these tiny organisms – in existence for at least the past 3.5 billion years, wield huge influence over us, shaping the past, present and future of all life. 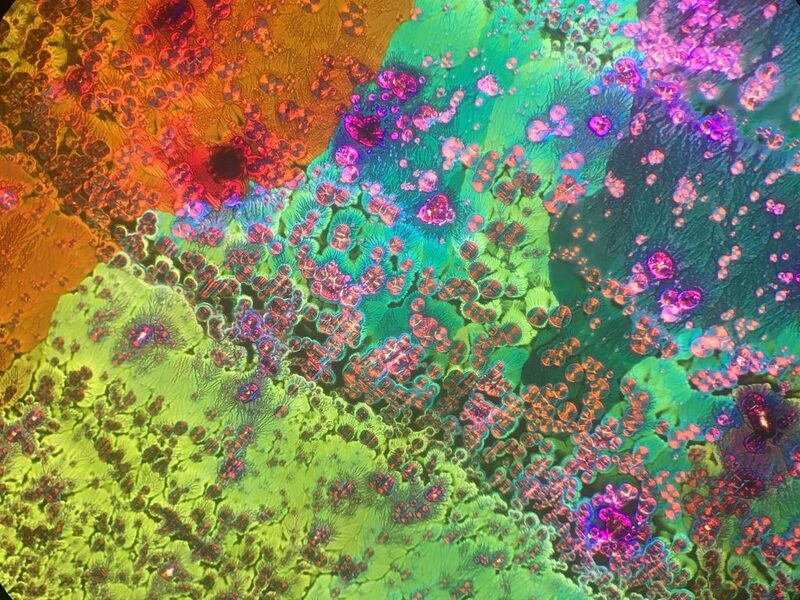 The exhibition explores the fact that bacteria were among the first forms of life to emerge and how 2.4 billion years ago, one type of bacteria started to release oxygen, creating the atmosphere as we now know it. Chicago has just closed the doors on its eighth annual Design Week, where SOM, a practice that explores the intersection of architecture and engineering, created the Kinematic Sculpture. 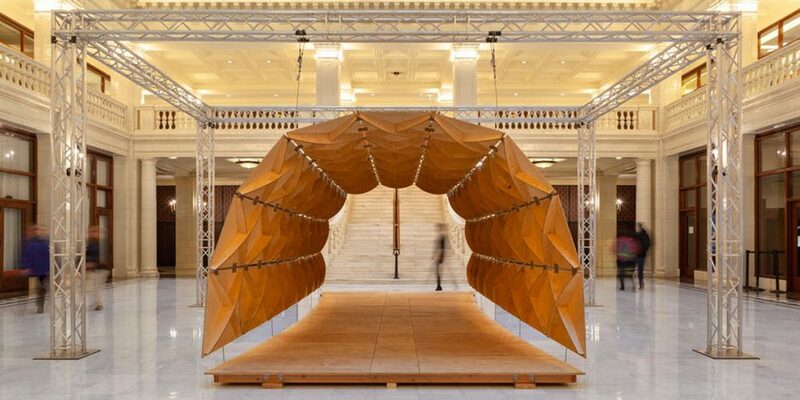 This 27-foot-long, origami-like pavilion, was in response to the Chicago Design Week theme Design in Motion and explored the science of motion through the lens of integrated design. SOM says the Kinematic Sculpture – on display in the lobby of the city’s Railway Exchange Building until the end of November — is inspired by ancient origami techniques and driven by the mathematical relationships between force and motion. It is built from wood and suspended above the ground from aluminium trusses and the “rigid origami” sculpture comprises 99 panels connected by stainless steel hinges. SOM wants its sculpture to open a dialogue and catalyse new ideas and approaches to engineering and architecture. The Jenny Sabin Studio is an experimental architecture studio based in Ithaca, NY where it investigates the intersections of architecture and science, and applies insights and theories from biology and mathematics to the design, fabrication, and production of material structures and spatial interventions. It regularly collaborates with scientists and engineers and employ architects, designers, and artists on diverse projects ranging from using materials, building facades, installations, pavilions, tapestries, rugs, and architectural interventions. 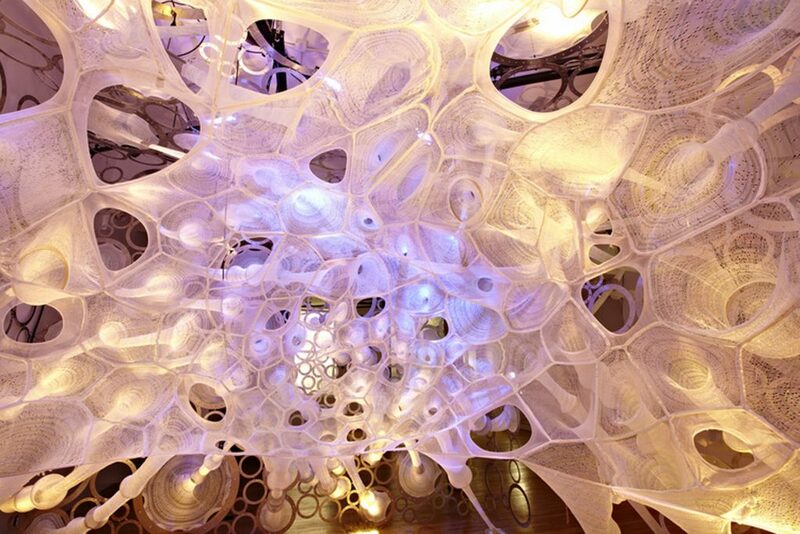 One of its recent projects was the MYTHREAD Pavilion – a fusion of science, art and technology open the door to new ways of thinking about structure and the relationship of the body to technology. Created to tell the story of Flyknit fabric technology from sports brand Nike, MYTHREAD comprised adaptive knitted, solar active, reflective photo luminescent threads and a steel cable net holding hundreds of aluminium rings to express the simplicity of knitted geometries meeting the complexity of a body in motion. The installation was designed to link biology and innovation with technology and tradition, to not only represent the benefits of Nike Flyknit, but also the activities and performance of the individuals that went into its making. There’s still time to catch Cooking Without Gas, the first solo show by Bristol, UK-based Dallas Collins at The Pound Gallery, which runs until Saturday, November 10. The fusion of art and science plays an important part in former aircraft engineer Collins’ work and his sculptures continuously oscillate between science fiction and fact in their endeavour “to explore the idea of a post-apocalyptic space”. 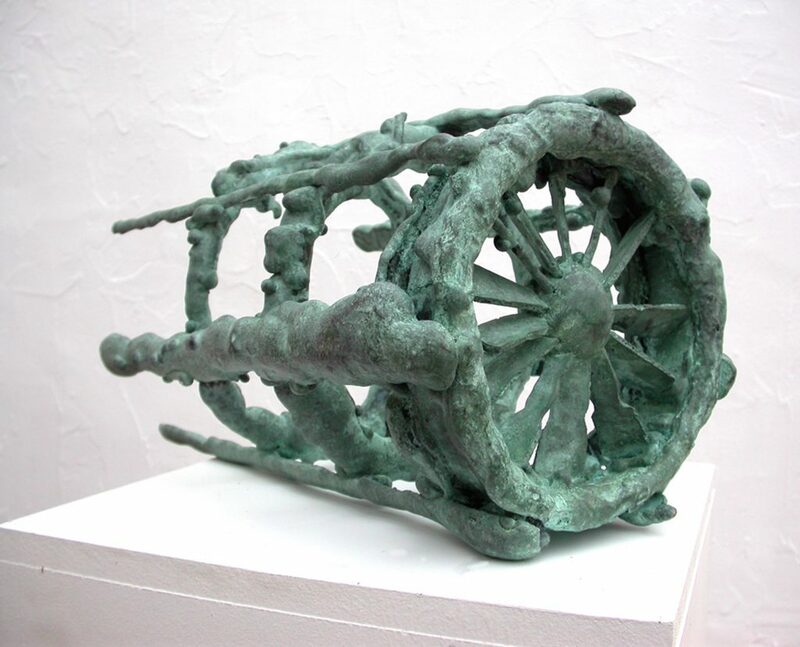 His work is frozen in a historical state of change by using bronze casting and a variety of construction methods. Collins was recently elected as an Academician at the Royal West of England Academy and has previously exhibited at Otherworldly at the Burghley Sculpture Garden, the VVM7 Exchange at Tate, Liverpool, and 1SSUE 16 at the West Wharf Gallery in Cardiff. Cooking Without Gas brings together an eclectic selection of sculptures and 2D works from Collins’ output over the past 18 years. Liquid Crystal Display, Photo: Site Gallery. Site Gallery is Sheffield’s international contemporary art space, specialising in moving image, new media and performance. Liquid Crystal Display – curated by Laura Sillars with Angelica Sule and running until January 27, 2019, is showing the work of more than 20 artists. Historically associated with mystical healing, gazing and alchemical practices, crystals are now prevalent in technology including computers, mobile phones and state-of-the-art medical equipment. At the heart of a laser-beam is a vibrating crystal, while touch-screen technologies, and the optical cables that keep us connected, are all enabled by crystals. All the works examine and observe liquid crystal phenomena, revealing the mystical properties of objects, linking technology and the natural world and exploring links between crystal, capital and contemporary culture. Artists featured are: Waad AlBawardi; Lise Autogena & Joshua Portway; Ralf Baecker; Anna Barham; Karen David; The Crystal World (Jonathan Kemp, Martin Howse, Ryan Jordan); Liliane Lijn; Ann Lislegaard; Penny McCarthy; The Otolith Group; Mungo Ponton; Eva Rothschild; Ruskin Collection; Shimabuku; Kiki Smith; Suzanne Treister and Jennifer West.